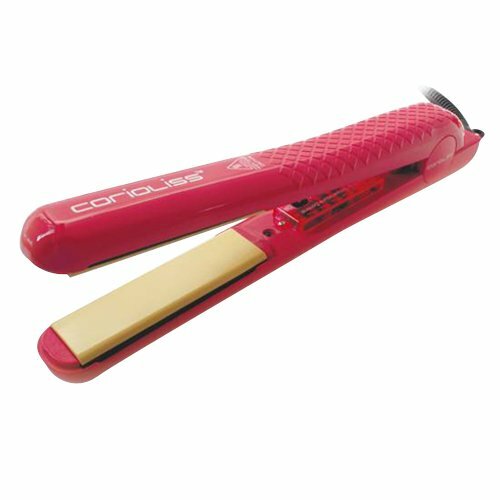 Karmin Salon Series Professional Flat Iron 1"
The Classic Pro is our original iron which has pro variable temperature control that allows you to decide the temperature setting that works best for your hair! Variable temperature from 140 to 410. Far infrared technology to seal in moisture to condition the hair. Negative ion technology to allow results to keep lasting. Over 9 feet of swivel cord which allows for easy movement of the cord. 100% stone solid ceramic plates. I got this as a gift years ago & have always loved it bc it doesn't burn out your hair since it's a 100% ceramic plate. Also never have to worry about my hair getting frizzy (naturally cutely hair) & I've lived in humid Florida. But when mine short fused I searched online for it & most sites were $150+. Writing this review its twenty dollars less than when I bought it a few weeks ago. Shipping was quick even though I'm fair from the mainland. Buy it you won't regret it! Did a lot of research before deciding on this item... all the reviews i read on this were good so i decided to go for it. I have dark long hair that is wavy. It's amazing working with this iron. I blow dry my hair and afterwards use the iron to straighten it. It even gives curls to the ends so its not fully straight. Its very easy to work with. I only put it on low medium heat and it works great! Very happy with the purchase. I was impressed with the super fast shipping, and I am very happy with this Corioless Hair Iron! This is the first flat iron I have actually purchased but that is because I usually used my roommates (she has a CHI but my price range was lower) and now, she is borrowing my Corioless Hair Straightener all the time! It works really great and gets hot enough to straighten my wavy, coarse hair quickly.